How is the Muscatine Fire Department Staffed? A few weeks ago, I had a nice time touring the Muscatine Fire Department and learning more about how the department works. Now, I’m going to give you a more in-depth look at how the Fire Department organizes itself in order to protect and care for Muscatine’s citizens. 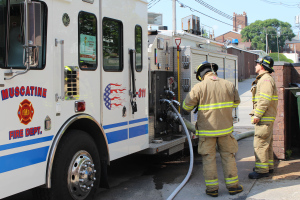 Today, I will tell you about staffing and the procedures in place to assure that Fire and EMS services are carried out safely and effectively. The Fire Department is a 37 uniformed member department. This includes a Fire Chief and an Assistant Chief who each work a 40 hour per week schedule and 35 members who each work a 56 hour work week on 24 hour shifts. This entry was posted in Budget, Cities, City of Muscatine, Municipal and tagged City of Muscatine, Fire Department. Bookmark the permalink.